I haven’t been posting a whole lot lately, but that doesn’t mean I haven’t been riding the bike. When it’s your means of transportation 95% of the time, you’re pretty much guaranteed a ride every day. That’s my favorite part of living car-free, and it’s working. Some highlights from the past week or so include finally getting a good ride up the Fallsway bike path again and wondering why people complain so much about being routed by the prison–at least you’re not in it, and why do we want to hide what we do to each other with all our cages? Oh, I think I know some answers to that one, and they aren’t pretty. There have also been rides through Clifton Park that made me smile that hard smile you only get when you’re flying in fall weather, rides up to Hampden for perfect peanut sauce on near-perfect chocolate ice cream followed up by an excellent session of acupuncture, a ride up York Road for a massage and some fried chicken at a Popeye’s that has a community garden for a backyard, and many, many rides up and down the hill to West Baltimore, a neighborhood I never used to visit but that I’m getting to know because the commute has rerouted me there. People talk about the need to “revitalize the Westside,” but given the number of people I have to dodge as I ride down Eutaw Street, it feels pretty vital to me. And then I lock up to one of the many bike racks in front of the University of Maryland Medical Center. I’m usually there too late to get my own Saris rack, and like everybody else, I’ll do my best to avoid sharing. I could think harder about the psychology of that, and given the amount of time I spend waiting for the shuttle, I’m sure I will. I also pass up these racks that require me to lift up my bike up or shove my fender through the slot in favor of the always-empty racks next to the smoking section. So yeah, I guess I overthink the rack business already. On Wednesday, though, this is what I came back to–an excellent reminder to lock up all wheels (locking skewers, I know, I know, Adam), or to take the front one with you. I hope that’s what this guy did. 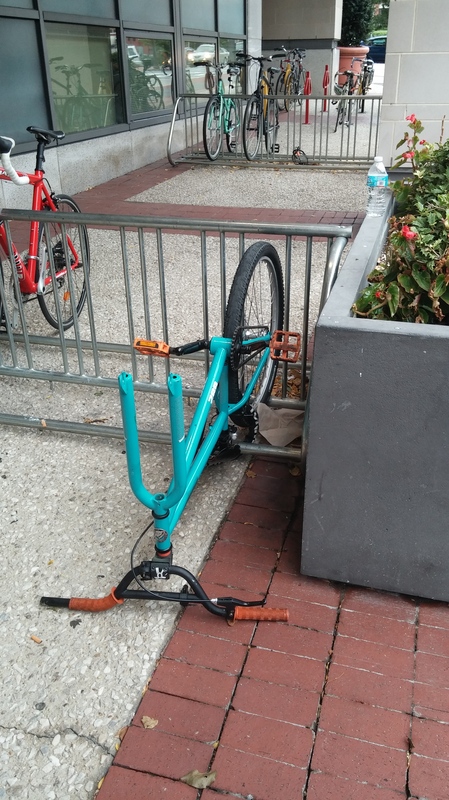 This entry was posted in commuting and tagged Baltimore, bike racks, West Baltimore, Westside. Bookmark the permalink.